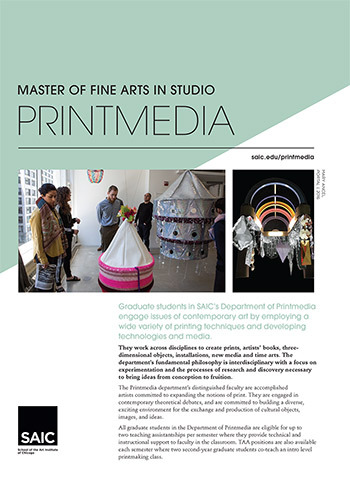 If you are ready to apply to the School of the Art Institute of Chicago’s (SAIC) Master of Fine Arts (MFA) in Studio program through the Department of Printmedia, you will need to first submit SAIC's Graduate Application form and then a corresponding ePortfolio for the Printmedia department. ePortfolios are required for each additional program to which you wish to apply. All submissions happen via the software SlideRoom. Admission to SAIC is for the Fall term only. Write a 500- to 700-word statement that describes your work or research. Discuss how you came to focus on the medium, body of work, or academic area you wish to pursue at the graduate level. Also discuss future directions or goals for your work, and describe how the Master of Fine Arts in Studio (Printmedia) is particularly suited to your professional goals. Upload your statement of purpose to the Attachments section of your ePortfolio. The Department of Printmedia conducts interviews by invitation only. Applicants who pass the preliminary review will be invited to schedule an on-campus interview in February. Notification will be sent by late January.